• Will Work With Item# S197998/197963/194257/194258/598031/194190/194220/194255. Space saving shape. Higher sides to reduce litter scatter. Low entry allows easy access for kittens and older cats. Made in the USA. .
• Litter Scoop Fits Inside This Clean Stand, For Easy Access. Removable privacy door. Durable plastic with reinforced bottom. Raised back pan contains litter scatter and spray. Made in the USA. . Durable plastic with reinforced bottom. Raised back contains litter scatter and spray. Easy entry for older or larger cats. 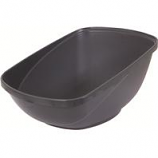 Made in the USA. .
• Classic Litter Sifter Made Of Durable Plastic. 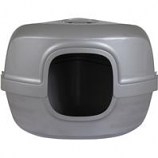 • Place Outside Your Cats Litter Pan To Help Keep Paws and Your Floor Clean From Litter Material. • 13.5 L X 17 W X .3 H. Blue and Clear. • Extra-Long Handle. Comfortable Rubber Grip. • The High Back Design Adds Sifting Capacity and Rounded Corners Will Get Into The Hard To Reach Places. • Deep Surface Grid Helps Trap Litter. 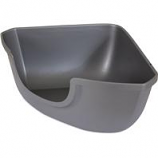 • Place Outside Your Cat S Litter Pan To Help Keep Paws and Your Floor Clean Free Of Litter Material. 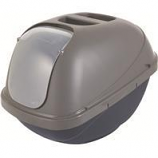 Ideal for cats that like to dig in litter. High sides reduce litter scatter. Durable plastic with reinforced bottom. Latches hold hood and base together. Odor-absorbing carbon filter included.